Last night was the night of a full moon, and that means it’s time for a report from the Lunar Society of the River Houses. Over time, it’s my hope that these monthly reports about the Lunar Society will evolve into something like a forum where homeschoolers participating in online research can share their achievements. As a simple example, here’s my own personal report for the past month on the two types of projects I participate in: eBird monitoring of bird populations, and distributed computing research using the Berkeley open infrastructure application. You and your students can participate in these projects (and many others) too. On the eBird website (eBird.org), sponsored by Cornell University, I’ve been tracking the birds in a small riverside park near me (eBird hotspot L6926932), and since our last Lunar Society report I’ve added 21 new checklists (daily observation reports), bringing my total for that locality to 356. When all the checklists are combined you can really see the seasonal distribution and migration chart for the year develop. By the end of next month I will have completed a full year’s monitoring of this one small park. You can start keeping a similar list for a location near you — your backyard, or a local park or other natural area. (Helping to track a public park or eBird “hotspot” will let you generate more interesting results.) You can even add photos and sound recordings to your reports if you wish. Just pay a visit to the eBird website (ebird.org) and start exploring. Note that the Great Backyard Bird Count, coming up in February, is an associated project and a great way to get started. Distributed computing projects use idle time on your computer to perform scientific calculations on various kinds of complex data. 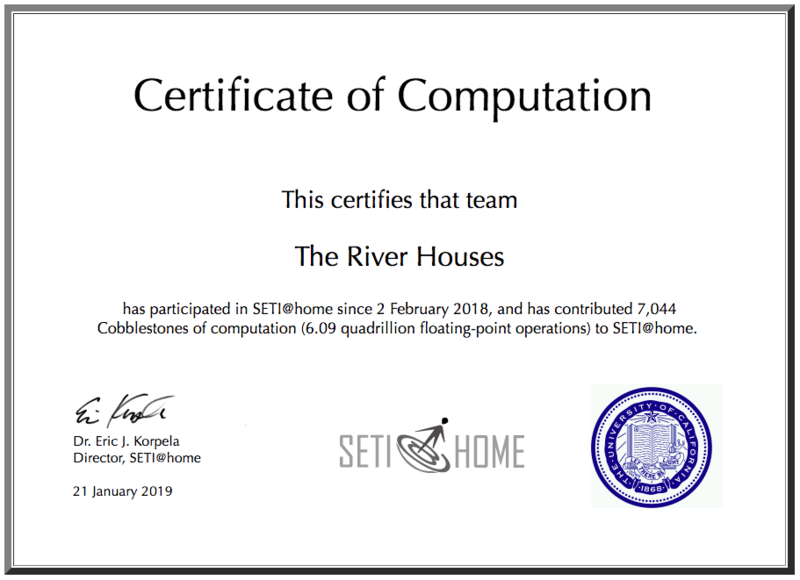 The most popular distributed computing projects run on the Berkeley Open Infrastructure for Network Computing platform (BOINC), and I contribute computer time to three of these: (1) the SETI@Home project, sponsored by the University of California, which searches for extraterrestrial intelligence (really! ); (2) the Einstein@Home project, which studies neutron stars; and (3) the MilkyWay@Home project, which studies the history and structure of our galaxy. The Internet provides exceptional opportunities for homeschool students to participate in real research projects in a variety of scientific and scholarly fields, something that would have been impossible only a few years ago. Pay a visit to our Lunar Society page to read about many more projects that your family can join.